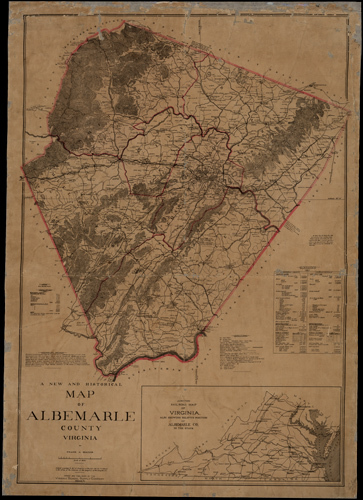 Blog //The 1907 Massie map of Albemarle Co. While going through our archives of scanned maps, we recently ran across a copy of Frank A. Massie’s 1907 “A new and historical map of Albemarle County, Virginia” [Special Collections, University of Virginia Library], commonly referred to as the Massie map, which contains a wealth of detailed historical information for the county in which the University of Virginia sits. After obtaining a more recent scan of the map from Special Collections and Andrew Curly (of the Library’s Digital Production Services), we georectified the digital map and added it to our geospatial data portal. Accessing the map through our portal (here or here) allows you to not only view the map at high resolution in your browser, but also to view the Massie map in Google Earth, as well as being able to overlay the Massie map over other base maps and other geospatial data layers (for example, by making a WMS call to our portal’s server from your desktop GIS; or by pulling the Massie map into your webpage-embedded dynamic map using Open Layers). Locations where various murders and river drownings occurred. Additionally, the map contains tables showing city and county data from the 1900 census and a 1906 household survey (listing, among other things: total property values and taxes; numbers of livestock (1000’s of cattle, horses, hogs, and sheep, but only 24 goats! ), wagons, watches, clocks, sewing machines, and pianos; number of manufacturers with their capital, number employees, and total wages; farm acreage; and enrollment figures for the white and colored public schools. There’s also an inset showing the major rail lines and railroad junctions for the state of Virginia. Cite this post: Dave Richardson. “The 1907 Massie map of Albemarle Co.”. Published January 27, 2010. https://scholarslab.lib.virginia.edu/blog/the-1907-massie-map-of-albemarle-co-is-now-in-the-portal/. Accessed on .